Ed McBain’s popular police-procedural detective novels, collectively known as the “87th Precinct” series, spanned almost fifty years and had some indirect influence on the structure of the professional/personal cop serials Hill Street Blues and NYPD Blue. 87th Precinct was, itself, made into a TV series – an unsuccessful, uneven actioner that lasted for only one year in the early sixties. 87th Precinct was brought to television by Hubbell Robinson, a former CBS executive who was shown the door when the network veered away from the dramatic anthologies that he had championed. Robinson landed at Revue, the bustling television company run by MCA, where he produced segments for the prestigious Sunday Showcase. In 1960, the cult classic Thriller went out under Robinson’s banner, and he sold 87th Precinct the following year. Robinson’s 87th Precinct reduced McBain’s panoply of police heroes down to four detectives: squad leader Steve Carella (Robert Lansing, who had played the same character in The Pusher, one of three low-budget films derived from the McBain novels), kvetching Meyer Meyer (Norman Fell), and two basically interchangeable pretty-boy plainclothesmen (Ron Harper and Gregory Walcott). The production was troubled – for reasons we’ll come back to in a moment – and the series died after thirty episodes. That version of 87th has been all but forgotten, except by the species of pop-culture diehard that frequent this blog. What is even less well known, and perhaps more interesting, is the fact that during the five years between the publication of the first novel, Cop Hater, in 1956, and the launch of the 1961 show, at least two other noteworthy attempts were made to televise the 87th Precinct franchise. The first came by way of David Susskind, the self-promoting impresario and quality-TV maven behind dozens of dramatic specials and, later, East Side/West Side. In 1958, NBC’s venerable Kraft Theatre inserted a Mystery into its title and staged a summer’s worth of live suspense and crime stories. The Kraft dramatic anthology was already a lame duck: the cheese company’s ad agency, J. Walter Thompson, had made the decision to turn the hour into a variety show, the Kraft Music Hall, headlining Milton Berle. 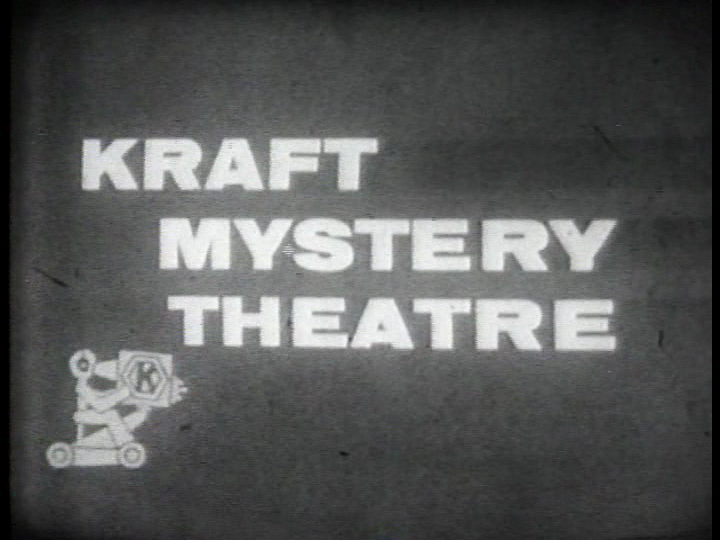 Susskind had produced a run of Krafts right before its Mystery phase, in a short-lived attempt to shore up the flagging series with name writers and stars. Now his company, Talent Associates, handled the final batch of Kraft Mysterys, too (although Susskind dropped his own executive producer credit). There was less fanfare now, but the talent was pretty hip: George C. Scott and William Shatner each starred in one, a twenty-one year-old Larry Cohen wrote a couple, and stories by pulpmeisters Henry Kane and Charlotte Armstrong were adapted. Alex March, one of the most acclaimed anthology directors, produced the series. It’s unclear whether this 87th would have been staged live, or if it would have been an early foray into filmed or taped television for Susskind. In the fall of 1958, NBC brought Ellery Queen back to television as a live weekly mystery (one of the very few live dramatic hours that was not an anthology). It’s possible that one pulp-derived crime series was enough for NBC that season, or that Ellery Queen’s difficulties (the lead actor was replaced mid-season, and cancellation came at the end of the first year) soured them on the McBain property. In any event, NBC passed on the Susskind proposal. Then, in 1960, Norman Lloyd tried to bring the McBain books to television. Lloyd was the associate producer of Alfred Hitchcock Presents since its third season, and had proven invaluable to producer Joan Harrison as a finder story material for the suspense anthology. As the series exhausted its supply of British ghost stories and whodunits, Lloyd was instrumental in mining the pulp magazines for stories that were more American, more modern, and more generically diverse than the material adapted for the early seasons. Lloyd also began to direct episodes during the fourth season, and proved himself a more gifted handler of both actors and camera than any regular Hitchcock director other than Robert Stevens (who won an Emmy for the episode “The Glass Eye”) or Hitchcock himself. When Lloyd’s contract came up at the end of Hitchcock’s fifth season, Lloyd entered into a bitter negotiation over renewal terms with MCA, which footed the bill for the show. Lloyd wanted a raise and, more importantly, a chance to develop series of his own for MCA. Although the deal was not tied to a specific property, Lloyd had his eye on the 87th Precinct novels, which by then numbered close to a dozen. Lloyd already knew Evan Hunter, the writer behind the “Ed McBain” pen name, because Alfred Hitchcock Presents had bought two of his short stories and hired Hunter himself to write the teleplay for a third episode. Manning O’Connor, the studio executive who handled the Hitchcock series, was prepared to green-light 87th Precinct with Lloyd in charge. But someone higher up the food chain killed the deal. Either MCA, which owned the rights, allowed Hubbell Robinson to poach the series because he had more clout; or Hitchcock quietly shot it down because he didn’t want to lose a trusted lieutenant. Or both. Furious, Norman Lloyd threatened to quit. O’Connor calmed him down, and eventually studio head Lew Wasserman himself stepped in to arbitrate the matter. Lloyd ended up with a bigger raise but no production deal of his own, and he remained with Hitchcock (eventually becoming its executive producer) until it went off the air in 1965. On the whole, I think I might rather have have seen Susskind’s or Norman Lloyd’s 87th Precinct than Hubbell Robinson’s. I don’t know how creative involvement Robinson actually had, but I’m guessing not much. His other Revue property from that period, Thriller, has been well documented, and most of the creative decisions on that show are generally attributed to others (mainly the final producer, William Frye). Like his former Playhouse 90 lieutenant, Martin Manulis, who went independent around the same time and promptly launched the escapist bauble Adventures in Paradise, Robinson struggled with the new realities of Hollywood television. In 1962, it was speculated that 87th got 86’ed because Robinson returned (briefly) to CBS, from whence he had been unceremoniously ousted in 1959. NBC, the rumor went, choked on the idea of paying the weekly $5,000 royalty that Robinson was due to a man who was now an executive at a competing network. Whether that’s true or not, I doubt that 87th Precinct could or should have sustained for a second season. Robinson’s producers, screenwriter Winston Miller (whose one noteworthy credit was My Darling Clementine) and Revue staffer Boris Kaplan, were competent but hardly auteurs. 87th adapted nearly all of McBain’s extant novels at the time, and those episodes were generally quite good. McBain’s spare prose boiled down into taut, violent, nasty little pulp outings. But once the series exhausted the novels, most of the original teleplays that followed were dull or far-fetched. None of the writers Miller and Kaplan recruited could capture the flavor of the books. The show, stranded on the generic Universal backlot, lacked any of the authentic New York atmosphere upon which Susskind, at least, would have insisted. Fatally, the producers began to shift the series’ focus away from the brooding Lansing and toward one of the secondary detectives, Roger Havilland, played by the bland and incongrously Southern-accented Gregory Walcott. Was Lansing difficult, or perceived as aloof on-screen, qualities that got him fired from his next numerically-titled series, 12 O’Clock High? Originally Gena Rowlands was a featured player in 87th as Teddy Carella; but she departed after only a few episodes. Rowlands’s ouster hurt the show, and received some coverage in the press. I suspect that the goings-on behind the scenes were more compelling than what was on the screen in 87th Precinct. That, as they say, is show biz.